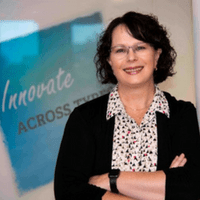 Joan Knight is Exelon Generation’s Innovation Director, responsible for leading innovation throughout the nuclear business and with key external partners. Joan created and is responsible for the employee idea pipeline for Nuclear. She championed creation of the Digital Plant Innovation Team, that now reports to her to implement synergistic, innovative technologies to improve productivity, decrease costs, and drive knowledge retention. Joan earned Certified Innovation Mentor status through the University of Notre Dame. Her 25+ years in nuclear includes roles as Site Engineering Director and Chemistry Manager. She has PWR and BWR SRO Certifications, working at Braidwood, Dresden and Exelon Corporate.